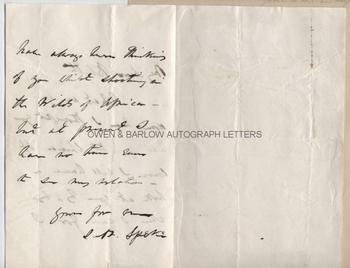 JOHN HANNING SPEKE AUTOGRAPH LETTER Signed. JOHN HANNING SPEKE (1827-1864). British African explorer. Discoverer of the source of the Nile. ALS. 2pp plus integral blank leaf. No place, no date. To "My Dear Blyth". "What are you doing here. I thought you had gone to China. Of course I will have a [look?] at you by and bye when I can for I have always been thinking of you whilst shooting in the Wilds of Africa - but at present I have no time even to see my relations." 8vo. Approx 8.25 x 5.5 inches. Laid down by integral blank leaf on album page. Fine. From the 19th century album of a Miss Shapter, the daughter of the Exeter surgeon best known for his book on cholera and his early researches into epidemiology. A contemporaneous note on the album leaf in Miss Shapter's hand reads "Captain Speke who with Captain Grant discovered the source of the Nile. Given me in August 1863. Obit. 1864." 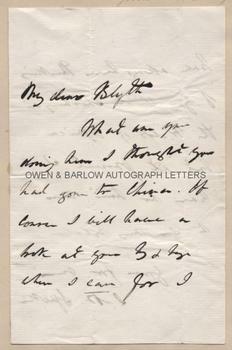 The letter is almost certainly to the zoologist Edward Blyth, an influencer and friend of Charles Darwin. Speke had sent two trophy heads of animals he had shot in Somalia to Blyth, who was curator of the Asiatic Society's collection in Bengal. Blyth subsequently named one of the species 'Speke's Gazelle'. Blyth had returned to London on March 9th, 1863, to recover from ill health. In 1864-65 he was engaged with Thomas C. Jerdon in writing 'The Birds of India' but had a mental breakdown and was committed to a private asylum. John Hanning Speke had served in India but left in 1854 to explore Somaliland. He discovered Lake Tanganyike with Richard Burton and Lake Victoria indipendantly. With Grant , he was the first European to cross Equatorial Africa. He correctly identified Lake Victoria as the source of the Nile, a claim which was disputed by his former companion, Burton. A debate was planned between the two before the Geographical Section of the British Association in Bath on 18th September 1864, but Speke died that morning from a self-inflicted gunshot wound while hunting in Neston Park in Wiltshire. An inquest concluded that the death was accidental, a conclusion supported by his biographer, although the idea of suicide has appealed to some. 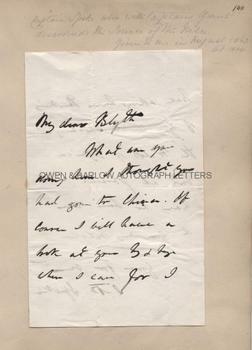 Given that Blyth did not return from India until March 1863, the letter must have been written at some point between Speke's return from his expedition to the source of the Nile in mid-1863 and his death in September 1864 - a time when he was working on the publication of 'What Led to the Discovery of the Source of the Nile' and was hotly engaged in his dispute with Burton. Hence his comment about having no time, even to see his relations. Miss Shapter's note would narrow the date still further to around May to August 1863. Due to his early death, so soon after his great discovery, LETTERS of John Hanning Speke are of the greatest rarity.